Andrew Roy "Andy" Gibb (5 March 1958 – 10 March 1988) was a British singer, songwriter, performer, and teen idol. He was the youngest brother of the Bee Gees: Barry, Robin, and Maurice Gibb. 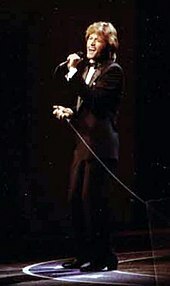 Gibb came to international prominence in the late 1970s with six singles that reached the Top 10 in the United States starting with "I Just Want to Be Your Everything" (1977), as well as three other top 20 singles. Gibb's success was brief, as he battled drug addiction and depression and died just five days after turning 30. Andrew Roy Gibb was born on March 5, 1958 in Manchester, England. He was the youngest of five children of Barbara and Hugh Gibb. His mother was of Irish and English descent and his father was of Scottish and Irish descent. He had four siblings: his sister Lesley, and three brothers, Barry and fraternal twins Robin and Maurice. In his childhood, his mother Barbara described Andy as "A little devil, a little monster. I'd send him off to school, but he'd sneak off to the stable and sleep with his two horses all day. He'd wander back home around lunchtime smelling of horse manure, yet he'd swear he had been at school. Oh, he was a little monkey!". At the urging of his brother Barry, Gibb returned to Australia in 1974. Barry believed that as Australia had been a good training ground for the Bee Gees it would also help his youngest brother. Lesley Gibb had remained in Australia, where she raised a family with her husband. Both Alderson and Stringer followed Andy to Australia with the hope of forming a band there. With Col Joye producing, Andy, Alderson and Stringer recorded a number of Andy's compositions. The first song was a demo called "To a Girl" (with his brother Maurice playing organ), which he later performed on his television debut in Australia on The Ernie Sigley Show. Sigley later informed the audience that it was from Gibb's forthcoming album, but it was never released. In November the same year, he recorded six demos - again produced by Joye - including "Words and Music", "Westfield Mansions" and "Flowing Rivers" (which was later released). What may have detracted from the "training ground" aspect of Australia for Andy compared to his brothers was that Andy was relatively independent financially, mainly because of his brothers' support and their largesse; hence, the group's sporadic work rate. Andy would disappear for periods of time, leaving Alderson and Stringer out of work with no income. Despondent, Alderson and Stringer returned to the UK. Gibb later joined the band Zenta, consisting of Gibb on vocals, Rick Alford on guitar, Paddy Lelliot on bass, Glen Greenhalgh on vocals, and Trevor Norton on drums. Zenta supported international artists Sweet and the Bay City Rollers on the Sydney leg of their Australian tours. "Can't Stop Dancing" (which was a Ray Stevens song, later a US hit for duo The Captain and Tennille in May 1977) was mooted for release, but didn't eventuate, although Gibb did perform it on television at least once on the revitalised Bandstand show hosted by Daryl Somers. Zenta would appear later as a backing band for Gibb, but did not participate on Gibb's recording sessions around 1975, which featured Australian jazz fusion group Crossfire. Around the same time, he married his girlfriend, Kim Reeder. Robert Stigwood, who at the time was the Bee Gees's manager, signed Andy to his label, RSO Records in early 1976, after he had heard some of Andy's demo tapes. Andy soon moved to Miami Beach, Florida, to begin working on songs with his brother Barry and co-producers Albhy Galuten and Karl Richardson. In late 1976 in Miami, Andy, with older brother Barry producing and recording in the famed Criteria Studios, set about making his first album, Flowing Rivers, around the same time as Eagles finishing their album Hotel California as Eagles guitarist Joe Walsh played on two songs on his first album. The first release from the album, and Gibb's first single released outside Australia, was "I Just Want to Be Your Everything" which was written by Barry, who also provided backup vocals. It reached number one in the United States and Australia and was the most played record of the year. In Britain it was a lesser hit, just scraping into the Top 30. Eight of the ten tracks on the album were Andy Gibb compositions, mostly songs written during his time in Australia. These included a re-recording of his previous single, "Words and Music". In September 1977 Flowing Rivers, with another number one single "(Love Is) Thicker Than Water" (also co-written by Gibb and his brother Barry) to support it, quickly became a million selling album. That single broke in early 1978 during the time that the Bee Gees' contributions to the Saturday Night Fever soundtrack were dominating the world charts. In the United States it replaced "Stayin' Alive" at the top of the Hot 100 on the day before Andy's 20th birthday, only to be surpassed by "Night Fever" at number one there two weeks later. On January 25, 1978, he had a daughter, Peta Jaye, but the couple had already separated before Reeder discovered she was pregnant. They divorced later that year. Andy then began work with the Gibb-Galuten-Richardson production team on his second album, Shadow Dancing, which was released in April 1978. The title track, written by all four Gibb brothers, was released as a single in the United States in April 1978. In mid-June it began a seven-week run at number one, achieving platinum status and the honor of being Billboard's number one song of 1978. In the United States, Andy became the first male solo artist to have three consecutive number one singles on the Billboard Hot 100, with all of the weeks at #1 from those singles just barely inside a year, from July 30, 1977 through July 29, 1978. Two further Top Ten singles, "An Everlasting Love" (which reached number five) and "(Our Love) Don't Throw It All Away" (which reached number nine), were released from the album, which became another million seller. In 1979, Gibb performed along with Bee Gees, ABBA, and Olivia Newton-John (duet with "Rest Your Love on Me"), at the Music for UNICEF Concert at the United Nations General Assembly which was broadcast worldwide. He returned to the studio to begin recording sessions for his final full studio album, After Dark. In March 1980, the last of Gibb's Top Ten singles charted just ahead of the album's release. "Desire" (written by all four Gibb brothers), was recorded for the Bee Gees' 1979 album Spirits Having Flown, and featured their original track complete with Andy's original "guest vocal" track. A second single, "I Can't Help It", a duet with family friend and fellow British and Australian expat Olivia Newton-John, reached the top 20. Around the same time, Gibb was invited to sing the first verse on Queen's "Play the Game" and lead singer Freddie Mercury apparently was amazed with Gibb's abilities. According to some sources, the tape was found in 1990 in a search of Queen archives for bonus tracks for a CD, but was not used. Since it has not been heard by any Queen collectors, its existence is somewhat doubtful, although record producer Mack has also confirmed that the version did exist. Gibb was ultimately fired from both Dreamcoat and Solid Gold because of absenteeism caused by cocaine binges. Said Zev Bufman, a Broadway producer and financier for Joseph and the Amazing Technicolor Dreamcoat, "When Andy was at the theater, he was a joy. But he wasn't there enough," adding that of the five people to play Joseph up to that point, Gibb was the best actor. He also said after Gibb's death, "We'd lose him over long weekends. He'd come back on Tuesday, and he'd look beat. He was like a little puppy – so ashamed when he did something wrong. He was all heart, but he didn't have enough muscle to carry through." An unnamed co-star in Dreamcoat was quoted as saying, "I hear he spent most of his time in his hotel room in front of the TV. I guess he was frightened and insecure. That's what happens when you're the baby brother of the Bee Gees." Commenting after Gibb's death, Solid Gold producer Brad Lachman stated, "...[Andy] was a very charming, vulnerable and charismatic performer. He clearly meant well. He wasn't being difficult. He was going through problems he couldn't deal with. He wanted everyone to love him. He had so much going for him, and he just couldn't believe it." His family convinced him to seek treatment for his drug addiction which included a stay at the Betty Ford Center in the mid-1980s. It was during this time that Gibb began touring small venues with a stage show featuring his hits as well as covers. He also appeared in guest-starring roles on several television sitcoms including Gimme a Break! and Punky Brewster. Following an extensive tour of East Asia, he regularly performed shows in Las Vegas and Lake Tahoe. In 1984, he was the headline performer at the Viña del Mar Festival in Chile, performing two nights in a row. He also held a two-week engagement at San Francisco's historic Fairmont Hotel in March 1986. Gibb now aimed to get a recording contract for release of a new album in 1988. He returned to the studio in June 1987 recording four songs; one of them, "Man on Fire", was released posthumously in 1991 on a Polydor Records anthology. Another track, "Arrow Through the Heart", was the final song Andy would ever record and was featured on an episode of VH1's series, Behind the Music, and released on the Bee Gees' Mythology 4-disc box set in November 2010. The songs are co-written by Gibb with his brothers Barry and Maurice. Their demo recordings with engineer Scott Glasel were heard by Clive Banks from the UK branch of Island Records. Gibb never formally signed a contract but the record label planned to release a single in Europe that Spring, followed by another single that summer with the album to follow. In early March 1988, Barry Gibb had arranged for Island in England to sign Andy, but when he went to England at the start of 1988, he panicked. Gibb missed meetings with the record company and blamed himself for his trouble writing songs. The deal was never signed. In an early February 1988 interview, Robin Gibb said Andy was healthy and ready to begin recording again. A few days later, Robin said "he just went downhill so fast", saying "he was in a terrible state of depression." He got over the drugs but the depression remained. On March 5, 1988, Andy Gibb celebrated his 30th birthday in London while working on the new album. Soon after, he entered John Radcliffe Hospital in Oxford complaining of chest pains. At around 8:30 am on March 10, 1988, Gibb's doctor told Andy that more tests were needed. But later that day, he slumped into unconsciousness and died as a result of myocarditis, an inflammation of the heart muscle caused by a recent viral infection (a diagnosis supported by William Shell, a cardiologist who had previously treated Gibb), which was exacerbated by his years of cocaine abuse. Robin Gibb said "he was also not eating properly and the lack of nutrition also damaged his heart," adding that the paranoia associated with cocaine abuse "shattered his confidence and he became scared of people." With the announcement of Gibb's death, his ex-wife Kim Reeder was not surprised, "I always knew that one day I'd get a call with news like this," she said. "It was only a matter of time." The Gibb family would also maintain it was not an overdose that killed Andy—as some papers suggested—but natural causes after years of drug and alcohol abuse. Gibb's body was returned to the United States where he was interred at Forest Lawn Memorial Park in Hollywood Hills, Los Angeles. The headstone reads Andy Gibb / March 5, 1958 – March 10, 1988 / "An Everlasting Love". ^ a b Erlewine, Stephen. "Andy Gibb Biography". AllMusic. Rovi Corporation. Retrieved 3 January 2015. ^ a b Melinda Bilyeu; Hector Cook; Andrew Môn Hughes. The Bee Gees. Retrieved 6 January 2015. ^ Women's Weekly, Australia, October 28, 1981. ^ a b c d New Idea, November 25, 1989. Robin Gibb: "Andy was scared of us", page 22. ^ a b Levin, Eric (28 March 1988). "Death of Golden Child - Untimely Deaths, Overdoses, Andy Gibb". People.com. Retrieved 6 June 2014. ^ "Gibb's Death Tied to Natural Causes". LA Times. UPI. 12 March 1988. Retrieved 19 April 2012. ^ "Andy Gibb's Grave at Forest Lawn Hollywood Hills (photo)". Retrieved 6 October 2012. ^ "andy". Users.iafrica.com. Retrieved 6 June 2014. ^ "Gibb brothers retract 'grief-stricken' criticism of hospital". The Scotsman. 14 January 2003. Retrieved 6 June 2014. ^ a b "UK Charts > Andy Gibb". Official Charts Company. Retrieved 20 May 2013. ^ a b "CAN Charts > Andy Gibb". RPM. Retrieved 20 May 2013. ^ a b "NZ Charts > Andy Gibb". Recording Industry Association of New Zealand. Retrieved 20 May 2013. ^ a b "NOR Charts > Andy Gibb". VG-lista. Retrieved 20 May 2013. ^ a b "SWE Charts > Andy Gibb". Sverigetopplistan. Retrieved 20 May 2013. ^ a b c d e "US Charts > Andy Gibb". Billboard. Retrieved 20 May 2013. ^ "Andy Gibb Chart History". allmusic.com. Retrieved 23 October 2008. ^ a b c d "CAN Certifications > Andy Gibb". Music Canada. Retrieved 20 May 2013. ^ a b c d e f g h "US Certifications > Andy Gibb". Recording Industry Association of America. Retrieved 20 May 2013. ^ "UK Certified Awards Search > Andy Gibb". British Phonographic Industry. Archived from the original on 6 February 2013. Retrieved 20 May 2013.